What to wear in a fight? As a mage, I always wondered about this question – even if you only have to stand back and use your arcane powers, why would you want to wear a long dress with loose sleeves on a battlefield? I definitely prefer some pants for better movement and repositioning in case you have to hurry! – Elegant Circlet: A friend send me this for disentchanting, but I kept it for the nice looks and later combined it with the Cindercloth Vest. At some point I will try and get the rest of the Elegant set.. Maybe I should stalk the AH more often. – Crimson Silk Pantaloons: Just a pair of pants that fits well colour wise and is easy to obtain fom a tailor. – Orange Martial Shirt: I prefer having a shirt under the vest for a less ‘naked’ look, and the orange that shows around the shoulders works well with the rest of the outfit and makes for a better connection with the gloves. This is another item you can get from any tailor who bought the pattern in Darnassus or Thunderbluff. – Silver-Thread Amice: Yes, I simply like to use parts of this set for other combinations, it always looks simple and elegant and fits well to a lot of things! Again, the auction house is my friend – and if I happen to find any silver-thread pieces while questing I always keep them, no matter how many of these I already have. There’s always a new character..! – Embersilk Mitts: I added gloves only because it looks better for the image of a mage on the battlefield, if they’re left out the pretty pattern on the sleeves of the shirt can be shown off. Also can be replaced with the Hands of Darkness from a tailor, I simply bought these because they were cheap and I was too lazy to look for an alchemist to make the required Potions. In my opinion this would also work well as a scarlet crusade outfit (at least partly) – as a caster/priest set or even for a scarlet monk. 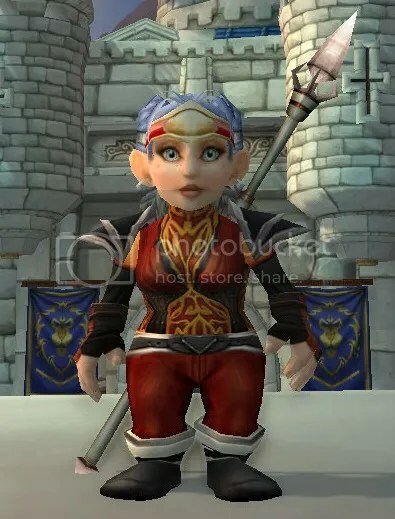 This entry was posted on Monday, July 15th, 2013 at 15:08	and tagged with clothing, mage, Tailor, world of warcraft, WoW and posted in Armor Sets, World of Warcraft. You can follow any responses to this entry through the RSS 2.0 feed.